Thailand's slave fishermen: What's needed to solve the crisis? 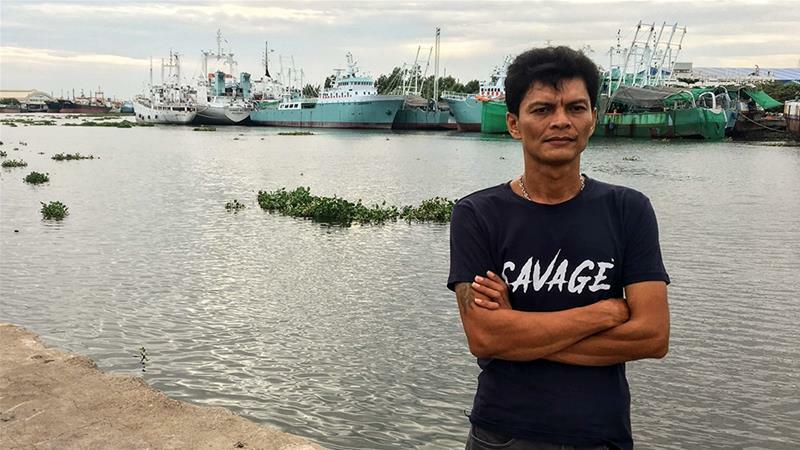 Samut Sakhon, Thailand - In 2013, Chairat Ratchapaksi found a job in commercial fishing to support his family. The 40-year-old from Thailand's central Phetchaburi province went to see a boat owner in Samut Song Kram Province, which straddles the Gulf of Thailand, and was hired quickly as a fisherman. From then on, he was at sea more or less continuously for two years , until 2015. He says he was forced to work 24-hour shifts, was not paid and, when he complained, was beaten by his skipper and threatened with being thrown overboard. At the end of his stint, he said he was "dumped on an island and put in jail". Chairat festered for months in one of the grim holding pens on Benjina, a remote Indonesian fishing island companies reserve for labourers they no longer need. 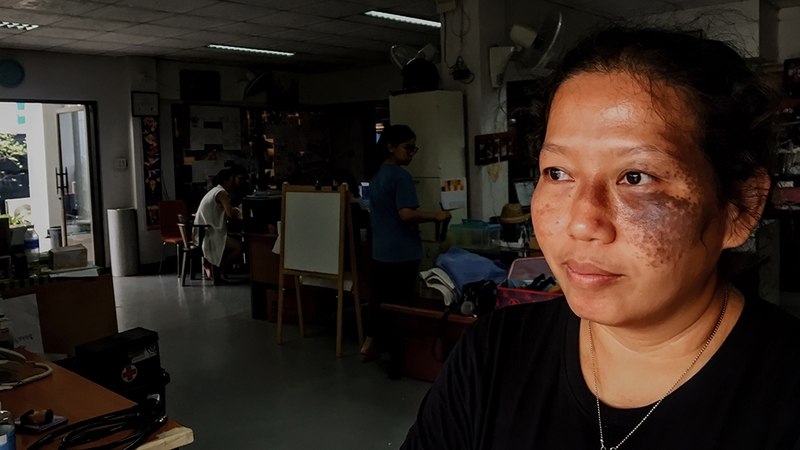 "I didn't know how to escape," says Chairat, who now runs the Thai and Migrant Fishers Union Group (TMFG). "We sent a letter to the Thai ambassador in Indonesia from prison but we got no response. Nothing happened. I thought, 'Who is going to rescue me?' I felt hopeless." Thailand is the world's third-largest seafood exporter and biggest producer of tinned tuna. Half of the estimated 600,000 men working in the industry are from countries such as Myanmar and Cambodia, according to the United Nations. Along with Thais, they are trafficked and forcibly set to work on commercial fishing boats throughout the region, supplying seafood products to global consumers. The Thai fishing sector returned export earnings of $5.5bn in 2017. It is a major foreign currency earner for the country, where food accounts for 10 percent of total exports. Human Rights Watch (HRW) in August called on Thailand to ratify and implement the International Labour Organization's Work in Fishing Convention. According to local NGO, the Labour Rights Protection Network, (LPN) as many as one in 10 commercial fishermen in the region are slave labourers. Testimonies gathered by LPN confirm that Chairat's experience is not unusual. Like Chairat, fishermen are forced to work for several years at sea, cut off from family and from the rest of the on-land world. Lek, from Kanchanaburi in Thailand's west, was rescued two years ago from another favourite Indonesian island which serves as a dumping ground, Ambon. He has a photograph of himself on his phone when he was stuck at sea. He hardly set foot on land for a decade as he was enslaved by his bosses. In the image, he looks young and has long hair. Now, his hairline has fallen back, he has an awkward stance and his eyes are deep-set. "Now I want to help my fellow fishermen," he says. Benjina, a dot in the Indonesian archipelago about 400 miles north of Australia, has become a notorious dumping ground for slave fishermen. Ex-fishermen told Radio Free Asia in 2014 that some workers were murdered there and buried in unmarked mass graves. The Thai government, concerned about international trade agreements in markets such as the EU and the US, which have raised human rights concerns, has worked to end the trafficking and enslavement of local and migrant fishermen in Thailand. Since 2017, trawler owners have had to ensure, by law, that there is adequate communication technology on every ship and to allow all workers to freely contact their families while on board. A s part of its anti-slavery efforts, the government also banned fishermen under the age of 18 from working and sought an electronic bank transfer system for wages, to verify payment is taking place. 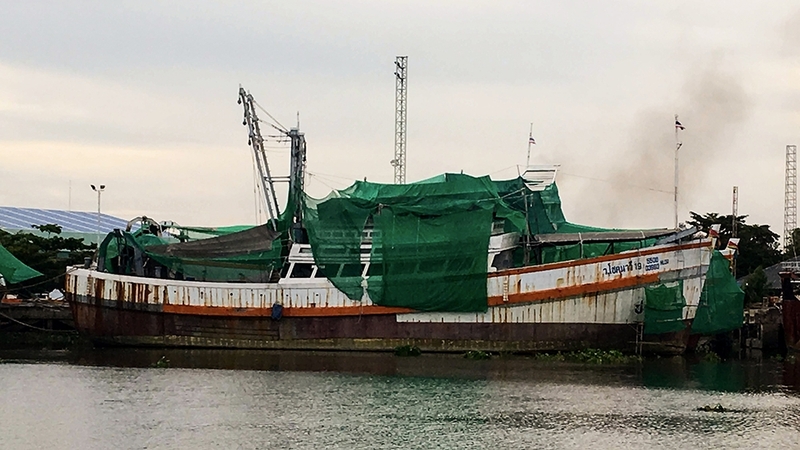 As a reward for its push to stamp out trafficking in the fishing sector, Thailand in June stepped up a notch of the US State Department's Trafficking in Persons Report - it had previously been Tier 3, the lowest possible level. Set up in 2015 as an initiative of the LPN, the TMFG monitors satellites to track ships that remain at sea for long periods, which is often a sign that they are using slave labour. Ships can stay at sea for years as they transfer their haul to larger boats, which take the produce back to shore. The monitoring system relies on regular inspections and policing, which are expensive and difficult to maintain. "The Thai government has not taken the steps necessary to end forced labour and other serious abuses on fishing boa ts," HRW said in January. The Thai government responded directly to the report and offered a long list of measures it says it had taken. "The Royal Thai Government reaffirms our commitment to combat the migrant workers' exploitation in a holistic manner â¦ and stands ready to work with all stakeholders in order to enhance our labour practices in alignment with the international labour standards," said the statement. The Thai government did not respond to Al Jazeera's request for comment. According to Patima Tungpachyakul, LPN director, one of the major logistical obstacles for regulators is the vast and complex supply chain in this sector. "There are so many participants in this industry," she says. "Many operators across the catching, processing and exporting links in the chain can mean the sector is very difficult to follow." The Thai Department of Fisheries lists 82 seafood processors approved for export alone. The LPN estimates that there are between 10,000 and 20,000 fishing boats supplying these processors. Chairat's escape came three years ago. He was spotted by a delegation including Patima and TMFG members who were visiting the island in order to repatriate enslaved fisheries workers. "We thought there were around 100 ex-slave fishermen there," Patima says. "We found about 1,000." For his part, Chairat says he was lucky to be found at all. &quo t;Some local villagers told the delegation about those of us in jail." Now as chairman of the TMFG, he works to find, register and eventually release and repatriate slave fishermen. The organisation estimates it has found and organised the release of around 4,000 slave fishermen since 2014. While they work through official channels, the work can be dangerous. It's not uncommon, for instance, for fishing companies to bribe local authorities, leaving the slave rescuers with no effective protection in isolated locations. Chairat fears he could be killed. Chairat, Patima and the TMFG team have developed a system whereby slave workers can make calls for help on their mobiles while at sea without being detected. The details of this scheme, Chairat said, must be kept secret. He now sees the release of slave fishermen as his central aim and is committed to freeing the workers and raising awareness of their plight. A consumer war on the industry, he says, is not the answer. "We don't want to pressure consumers to stop buying seafood," he says. "A boycott affects the fishermen too. The solution is that the workers have to have power. There has to be collective action."